I'm not a slogan-on-a-tee-shirt guy. But I might have to make an exception with this one. For Bonhoeffer, Luther was certainly not saying anything like, "Go forth and sin, because nothing that you do or don't do will secure your salvation." Nope. There's more of a challenge embedded in this injunction. It's about plainly and honestly acknowledging our shortcomings, and trusting in the power of forgiveness. "Take courage and confess your sin," explained Bonhoeffer, "do not try to run away from it, but believe more boldly still. You are a sinner, so be a sinner, and don't try to become what you are not." Confessing. That's hard. Still, I am convinced that we are not punished for our sins, but we are punished by our sins. So having the courage to own a shortcoming and proclaim it to other people opens the possibility of liberation. But to confess is to make yourself vulnerable, open to judgment, open to alienation. That's why we hope for a response of forgiveness, of embrace. It allows us to join together in our imperfection, to abandon any sense of our own perfectibility. A truly loving community is defined by it's ability to forgive. In forgiving, we find solidarity in honesty and humility. It all makes sense to me. It really does. But I tend to cling to my sins, to keep them securely to myself. After all, saying "I was wrong" is no small task. It's much easier to put up a front, to say "hey, I have it all together." Meanwhile, on the inside, I am a complete and total mess. Hey, does that qualify as a confession? Nah. 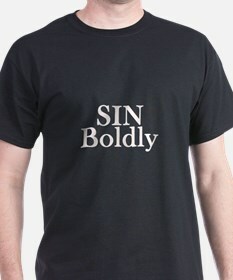 It's only me bold-ishly sinning. I guess that I still have some work to do.